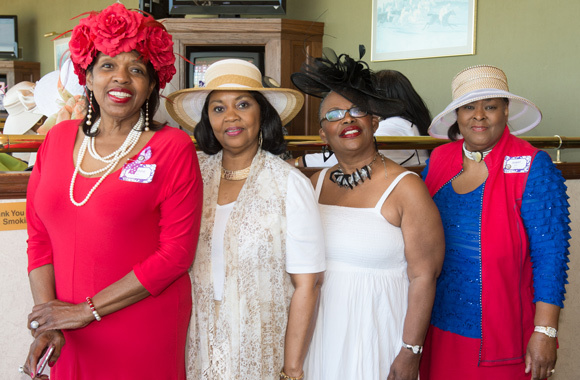 Magnificent hats and fascinators in a full array of colors, styles and sizes were showcased during the 6th Annual SIUE’s Meridian Derby at Fairmount Park Racetrack’s Top of the Turf in Collinsville. Approximately 230 attendees dazzled in their vibrant derby attire, engaged in camaraderie and celebrated the SIUE Meridian Society, which is a philanthropic organization committed to the promotion of women’s leadership and investment in SIUE community-based projects. Through collective giving, the women of the Meridian Society demonstrate a spirit of philanthropy and a commitment to making a positive impact in the community. To date, the Meridian Society has supported 112 projects totaling more than $275,000.